Good Dough is gooood though! Haha, pun intended! I had been hearing a little chatter here and there about Good Dough well before their Grand Opening a few weeks ago as they’ve made their doughnuts available at a few pop-up events throughout town prior to. 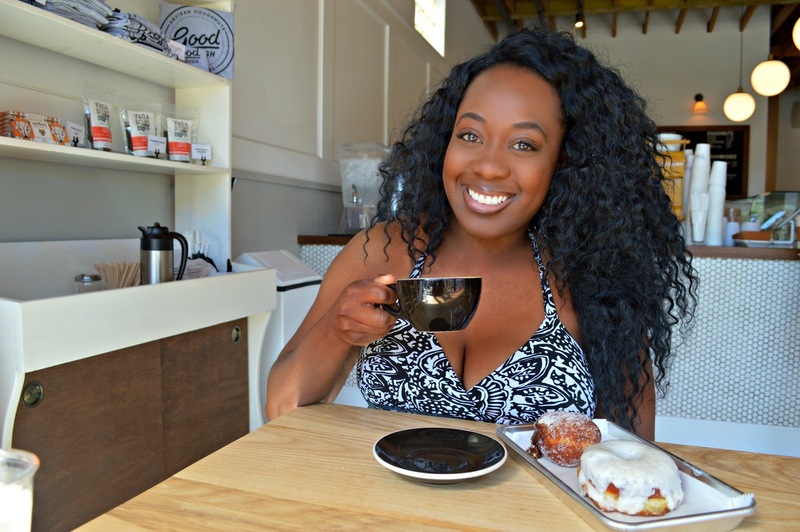 I was excited to finally make my way out to their new brick and mortar in San Marco last week! I was anticipating long lines so my mom and I got there pretty early but there were only 3 people ahead of us. I was also crossing my fingers hoping that they wouldn’t run out of doughnuts as I heard they did every day during their first week. Welp, that didn’t happen either! Needless to say, we went on a good day! 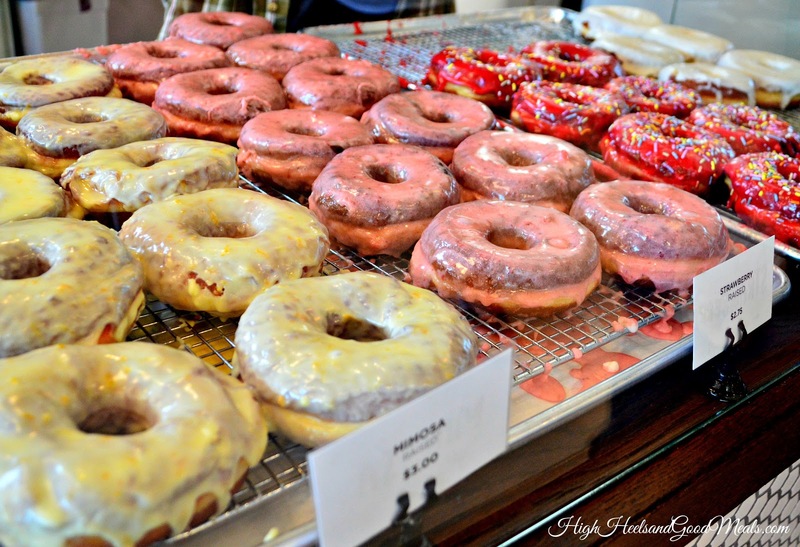 Good Dough specializes in artisan donuts and coffee so each doughnut ranges between $2-$3 bucks. Some may find that a little pricey but you’ve got to remember that they are hand-crafted and made fresh, in small batches daily! As a matter of fact, you can watch them make the batches in house! I love it when restaurants do that! The flavor options were pretty unique. Take the Mimosa doughnut for example! I’ve never had a mimosa flavored doughnut but I have a sneaky suspicion that it has an orange flavor. 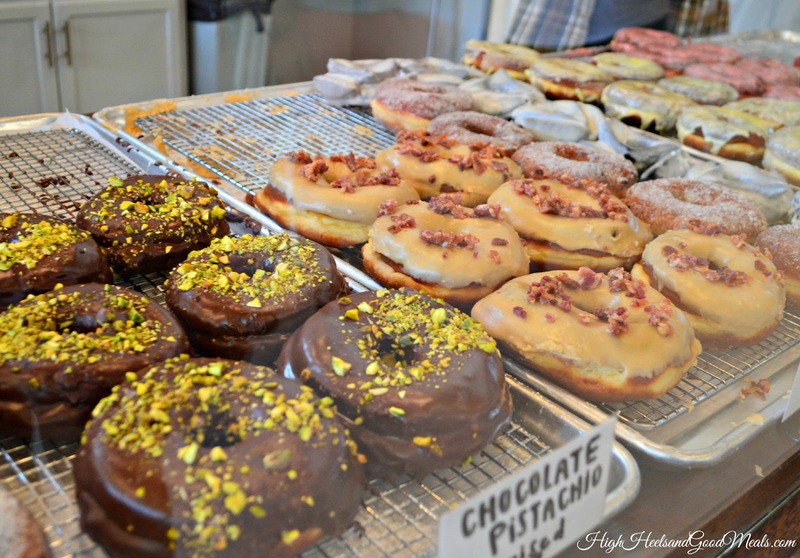 It is on my short list of doughnuts to try next time I visit. 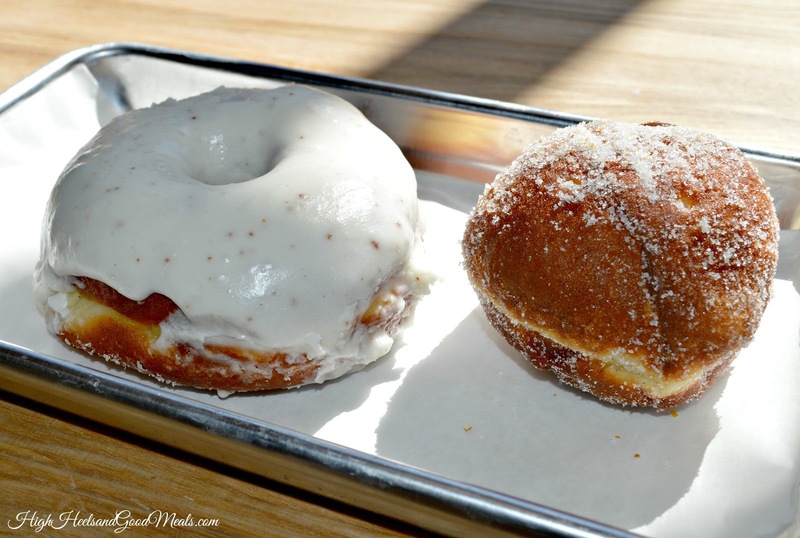 Ooooooh and you know what would be really great…if they actually sold mimosas to go with their mimosa doughnut! Now there’s a thought! Other flavors that day included Honey Lavender, Cardamon sugar, Strawberry, Chocolate Pistachio, Salted Caramel, Molly Ringwald w/sprinkles (raspberry), Monte Cristo, Brown Butter, and Nutella Bombs. I believe their menu will vary throughout the seasons, consisting of their regular doughnuts and specialty doughnuts but with that being said, I was a little bummed that they didn’t have a regular glazed doughnut on the menu. 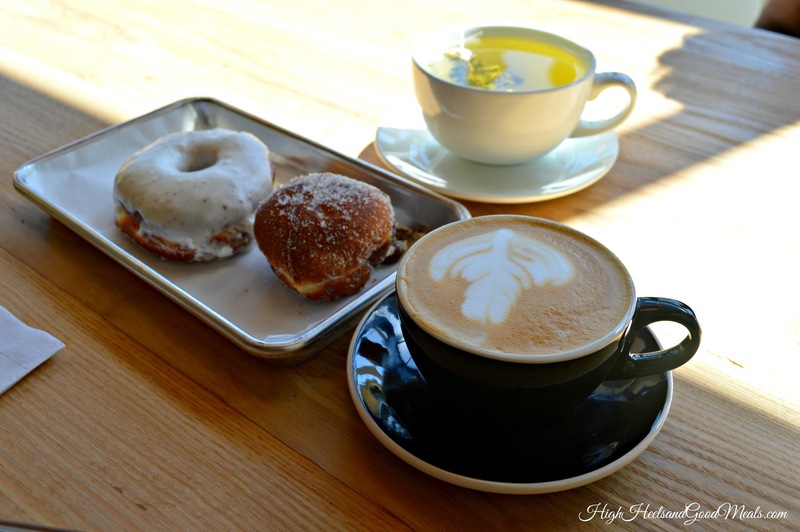 I asked which doughnut would be the closest to it and the Brown Butter doughnut was the recommendation so that’s what I got along with a nicely caffeinated cappuccino. Good Dough serves locally roasted Vagabond coffee (here) and I really love the local camaraderie! My mom got the Nutella bomb and a green tea. So as for my opinion…. The doughnuts were very rich, very very sweet, and a little more dense than I’m used to. However, the flavors were great! My mom mentioned that the Nutella bomb would’ve been perfect with a few chopped hazelnuts inside or on top! So listen…I had to make a second trip to Good Dough with very concrete intentions to try something else I saw on the menu! 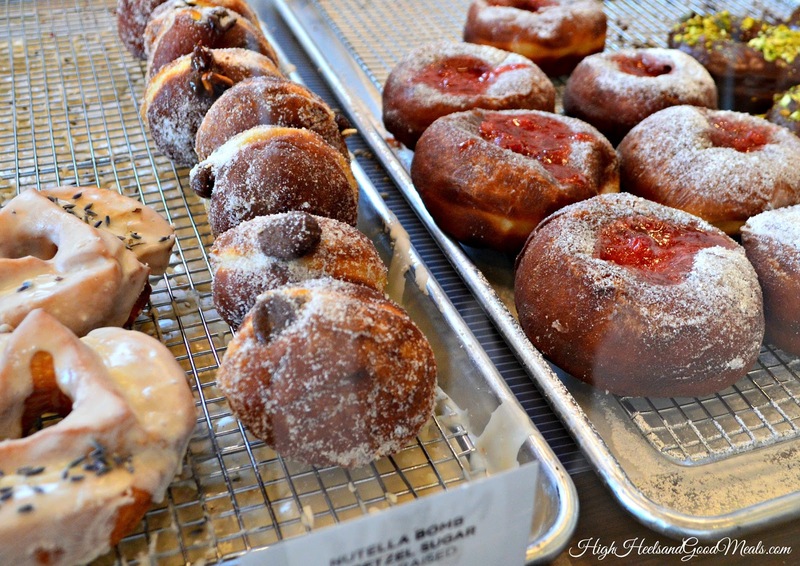 Besides the artisan donuts, they have Doughwiches! Yep that’s right, doughnut sandwiches. They currently have two, the Ham, Egg, and Cheese Doughwich and Fried Chicken Doughwich! You already know which one I went back for! 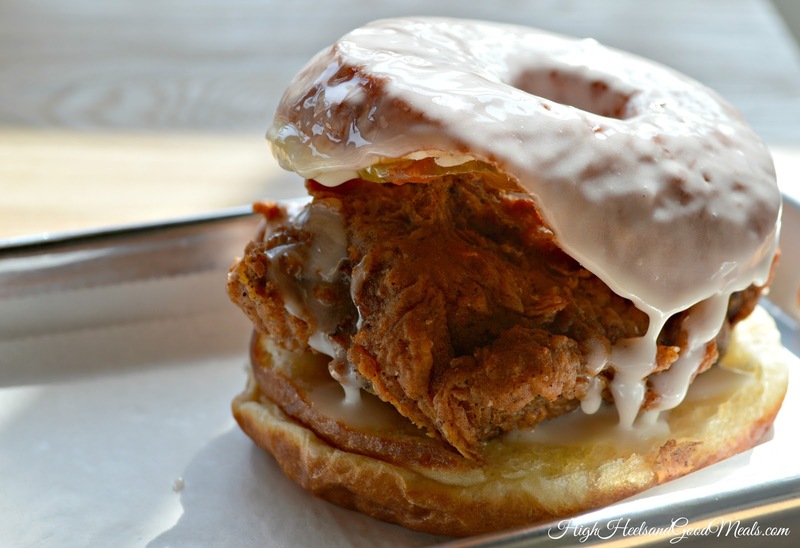 Yep, that’s right, the Fried Chicken Doughwich! Y’all….this sandwich was AMAZING! Of course I did not eat it all in one sitting because I’m trying to get my gym life back in order but WOW! The beer battered chicken is flavored to perfection, fried to a perfect golden brown, topped with homemade pickles, and placed in between a split glazed doughnut (you know, the one I was missing from my first trip)! When they brought it out to me, it felt like the moment when restaurants surprise you with a complimentary dessert on your birthday! I was more in awe with how delicious it looked but trust me when I say it tasted just as good as it looked! Overall, I really like Good Dough! As with most new things, there are a few kinks that can be worked out but I’m confident they’ll flourish and I am looking forward to my next visit! Which doughnut would you be most interested in trying? Previous Post What Fashion Rules?